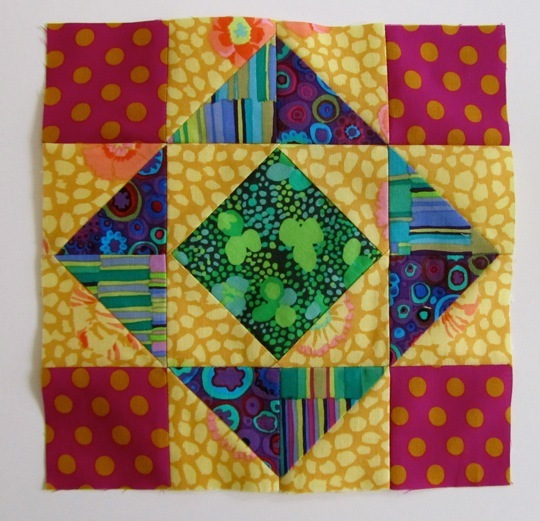 Welcome to the Mrs. Schmenkmanquilts’ stop on the Blogger’s Block of the Month tour! Thanks to Jackie for including me — much appreciated to have a goal and to be able to play along! My block is called Triangle Squares. Hmm, creative. Well, that’s what Grandma Dexter called it, and it is block no. 2041 in Barbara Brackman‘s Encyclopedia of Pieced Quilt Patterns (ooh, ouch, when did that go out of print?). Whatever you call it, I like it. It’s easy to make and you’ve got a lot of areas for the variations of your choice. For example, use more than one background fabric. Mine is gold. Use one on the inside of the block and one on the outside. Or make your corners match your center. 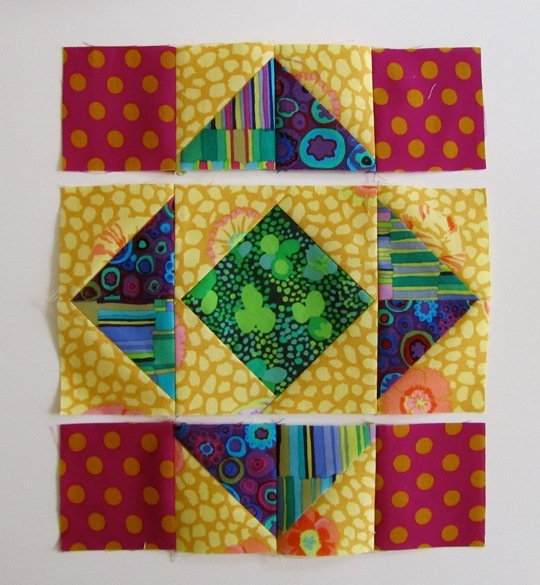 Use two more contrasting fabrics in the half square triangle blocks — those could definitely add some pop. 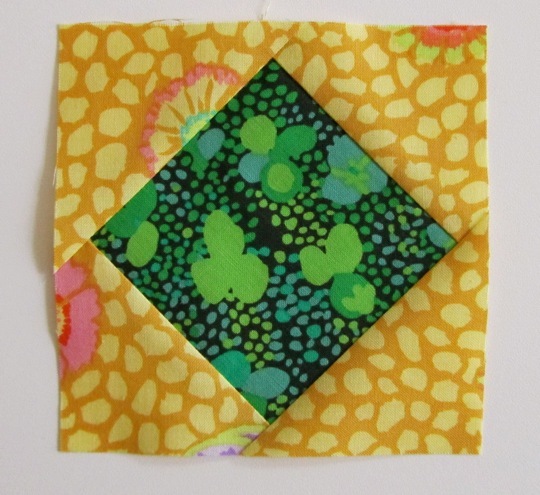 The finished block size for Triangle Squares is 8″. 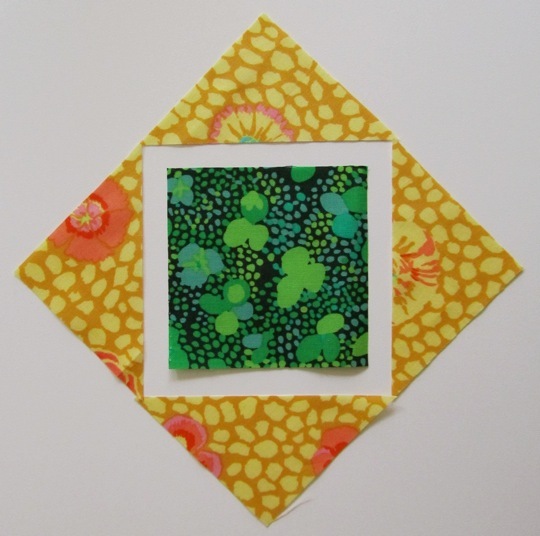 For the block background, I used the gold Guinea flower print. 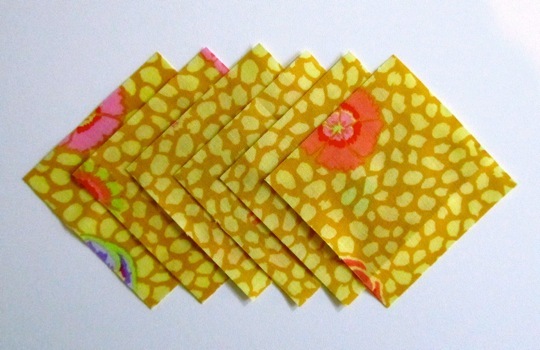 Cut 6 – 2 7/8″ squares. Cut the squares in half once diagnally. 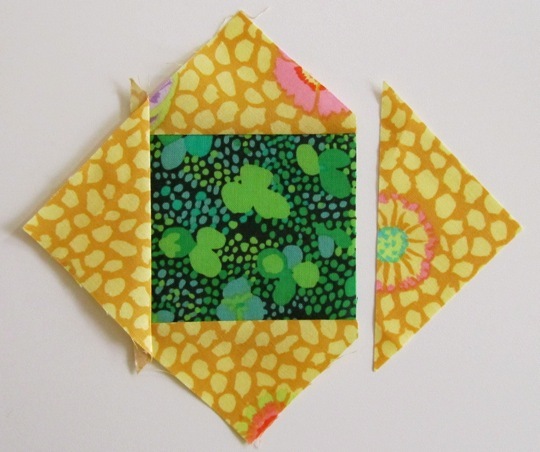 For the half-square triangle blocks, cut two 2 7/8″ squares from each of two fabrics. 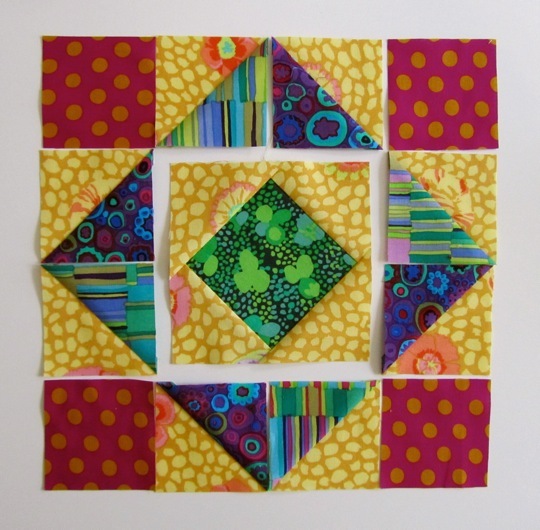 For the center, cut one 3 1/4″ square. 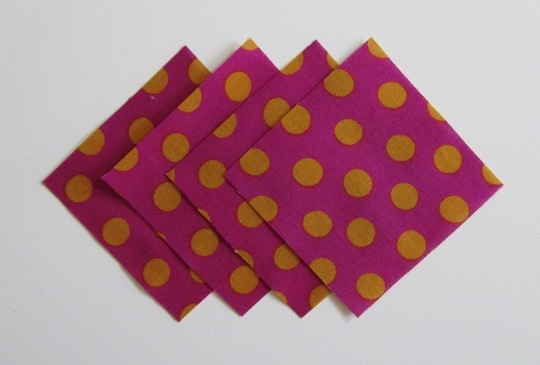 Be sure you are sewing scant 1/4″ seams. You can either press seams open or to one side. I have used a combination — pressing the half-square triangle units to one side and pressing the final seams open to better distribute bulk. Press these triangles out and trim the triangle corners even with the center square if you desire. Press and trim any little triangle ears. The piece should measure 4 1/2″. 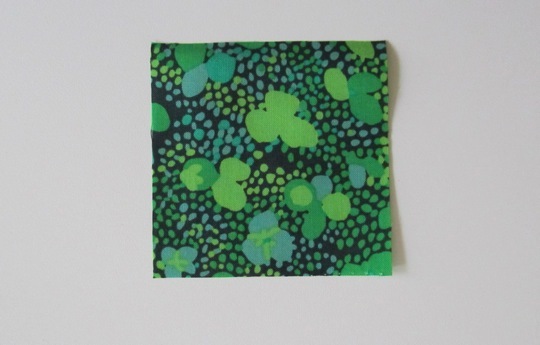 It’s important that there be 1/4″ seam allowance beyond the corners of the blue and green center square — you don’t want to lose your corners into the next seam. Now piece the half-square triangle blocks. First match up triangles with background triangles and sew four of each. 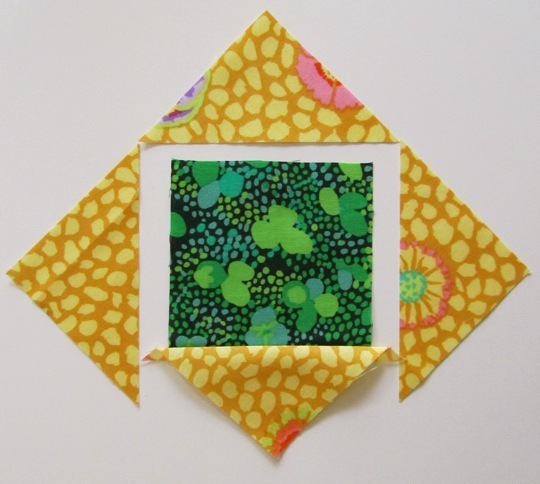 Trim the corners and make sure your half-square triangle blocks measure 2 1/2″. Now it’s time to assemble your Triangle Squares blocks. 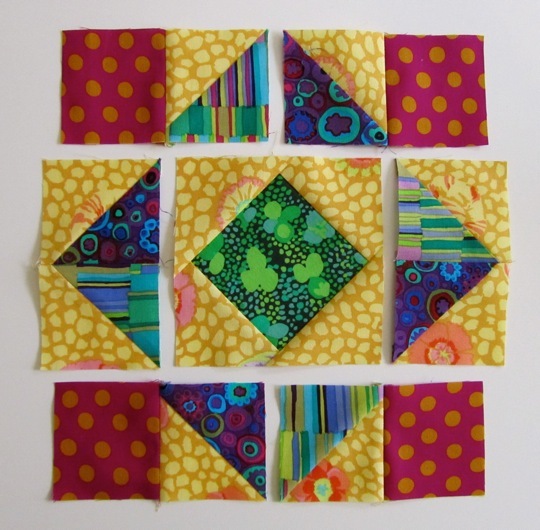 Begin assembly by piecing together the half-square triangle blocks on each side. 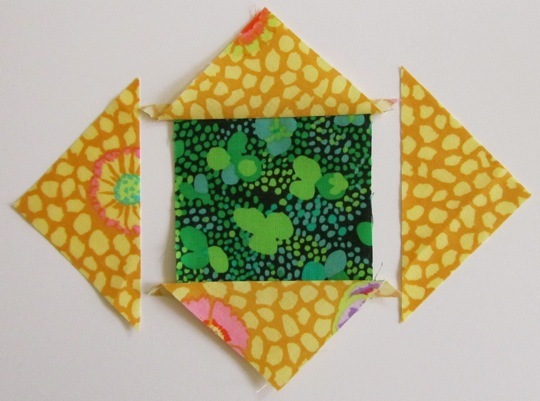 On the top and bottom, piece the outer corner (purple spot) together with its neighboring half-square triangle block. Finally, sew the top and bottom rows to the center row. Press well and you are done! I hope you enjoy the block! 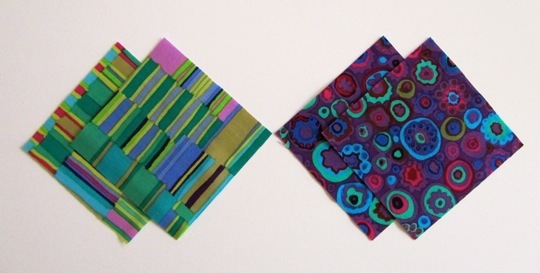 You can see what other quilters are up to in the Bloggers BOM Flickr group. Here are links to other blocks in this series, completed and ones to come. Don’t miss ’em.